These five exclusive listings showcase the best Miami Beach waterfront condos currently on the market. All five of these condos or penthouses have amazing ocean views and have a good balance of indoor and outdoor living space. Several of these listings are turnkey, which means they are practically move-in ready for the right buyer. These Miami Beach waterfront homes are luxurious and have an amazing balance of minimal design with sophisticated accents to suit any lifestyle and design preference. For those looking for Miami Beach waterfront properties, these exclusive Pobiak Properties listings are ideal for those looking for something on the water right in the city. The Mansions at Acqualina Private Residences are an amazing option for those looking for Miami Beach waterfront condos. There are two units available, #801 and #601, both of which are three bedroom and six bathroom units. All units are part of the 5-star residence in the iconic tower. The high rise gives the most luxurious views of the beach and ocean. The interior exudes luxury from the marble work throughout to the chic layout and upscale details. These waterfront homes for sale on Miami Beach won’t be on the market long. Of all the Miami Beach waterfront condos, the penthouse at 3300 N. 188th St. is pure luxury. With 4,020 square feet of living space and 11 foot ceilings this unit feels open and spacious. The private elevator foyer showcases the amazing views of the ocean and coastline. Other highlights include the detail work in the kitchen and living spaces as well as the turnkey availability. This waterfront home for sale on Miami Beach takes all the large living a mansion provides and packages it elegantly in a move-in ready waterfront penthouse. Another Miami Beach waterfront property that exudes luxury is the penthouse at 3250 N. 188th St. The unit is a corner penthouse that rivals any mansion, hotel, or resort. There are four bedrooms and four bathrooms. The master bath has an amazing soaking tub and large glass shower. The lavish interior has minimal tones and elegant details, which is perfect for anyone looking for a turnkey penthouse right on the beach. There is an amazing curved patio overlooking the city and water beyond, along with the building’s elevated pool and spa, this Miami Beach waterfront property is truly elegant and a must see. 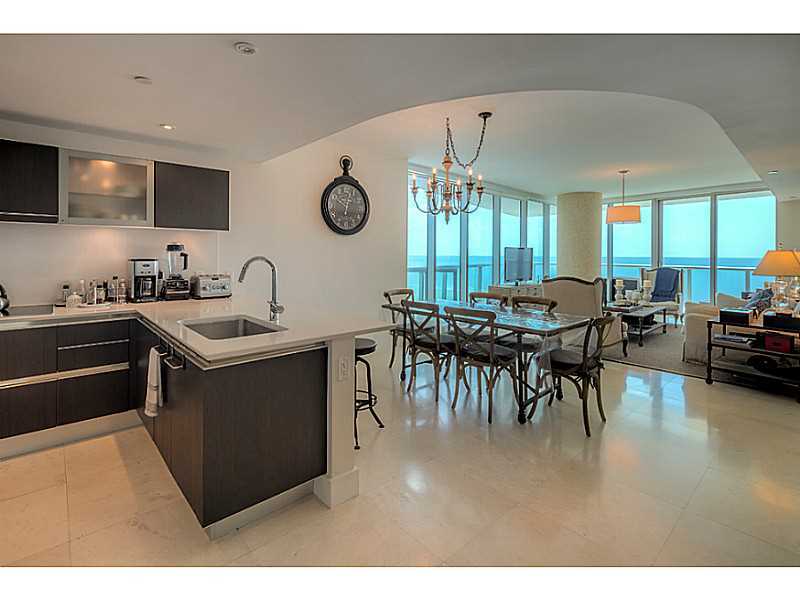 Lastly is this corner penthouse unit that’s priced to sell among all the Miami Beach waterfront properties. The penthouse is flooded with light with floor to ceiling windows in almost every room. That Florida sunlight continues on the unique glass railing patio space that overlooks the ocean. This unit has a minimal yet sophisticated esthetic and does an amazing job of bringing the beautiful view into the home. There is plenty of open living space in this penthouse as well as private bedroom space, which is great for balancing hosting company and finding privacy. This entry was posted in Luxury Homes, Miami Beach Lifestyle, Miami Beach Luxury Real Estate, Miami Beach Neighborhoods, Miami Beach Real Estate, Miami Beach Waterfront Homes and tagged Miami Beach, Miami Beach Waterfront Homes, Pobiak Properties, Waterfront Homes on January 25, 2017 by Giancarlo Bobbio.